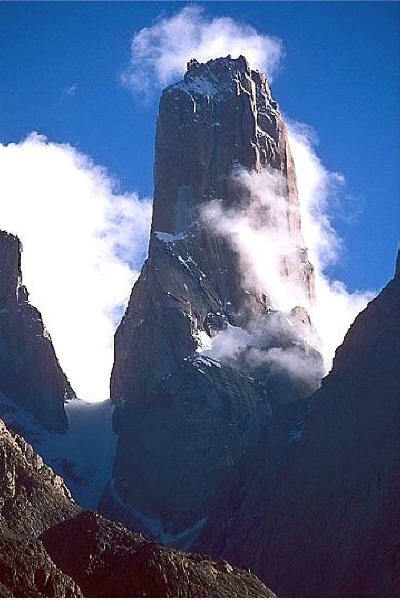 Great Trango Tower, Pakistan. One of the highest vertical faces on Earth..
Geologists continue to depend on theories that were first proposed in the seventeenth century, or perhaps by the ancient Greeks. Erosion: the process of eroding or being eroded by wind, water, or other natural agents. From erode, gradually wear away (soil, rock, or land): the cliffs have been eroded by the sea. Most children are taught simple geological theories when they enter elementary school. The principles of wind and rain are presented as the "natural processes" that take millions of years to create the various landscapes in which we live. Rain is not the harmless fall of water droplets gently tapping on the windowpane, but is a carbonic acid solution that is dissolving the very bedrock, converting it into atmospheric carbon dioxide and mineral salts that wash down to the sea. This "weathering" is said to have been wearing away the mountains for several hundred million years, since rain began to fall on this planet, much like it is doing today. The blowing breezes carry minute dust motes that crash into cliff faces, chipping away at their adamantine permanence with inexorable power, slowly reducing them to powder. Vertical walls become long slopes; steep valleys are gradually ground down into meandering river valleys; sharp mountain peaks slump into flattened hills and then slip back into the topography out of which they were formed. Giant boulders are split into pebbles by water freezing inside cracks, expanding as it freezes and pushing the cracks farther apart with every seasonal cycle. After millions of years the boulders get smaller and smaller, accumulating in riverbeds, piling up into mountains of gravel, creating vast sandy beaches or desert dunes that cover entire countries. Since the earliest days of Electric Universe theory, a suspicion has existed in the minds of its investigators that something was wrong with the "long, slow" view of geology. Because fossils are dated based on the rock layers in which they are found, a uniformitarian view of geology influences the understanding of how life began and evolved on Earth. If the rock ages are wrong, fossil ages are wrong, as was discussed in part one of this paper. Great Trango Tower is an example of contradictory morphology when it comes to the consensus view of erosion. It is composed of granite and rises to 6286 meters above sea level. 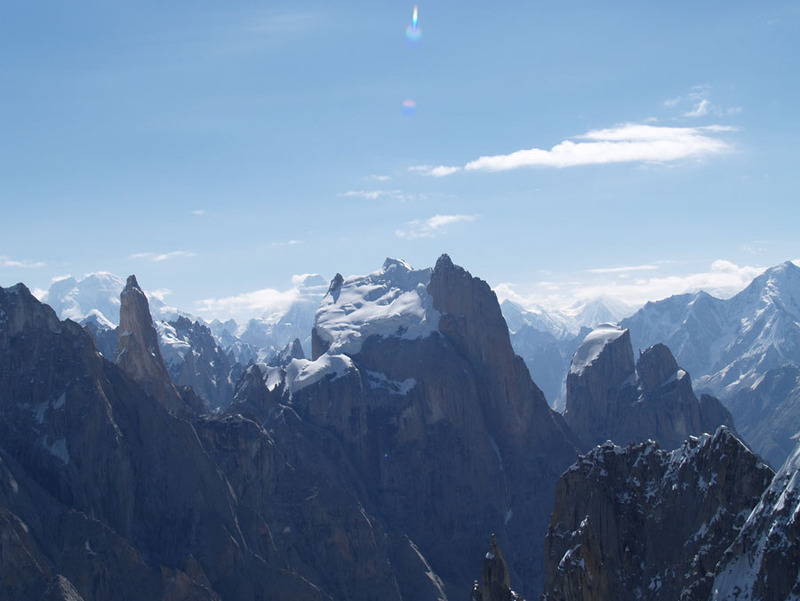 One of its distinguishing features is the world's highest nearly vertical drop—1340 meters. 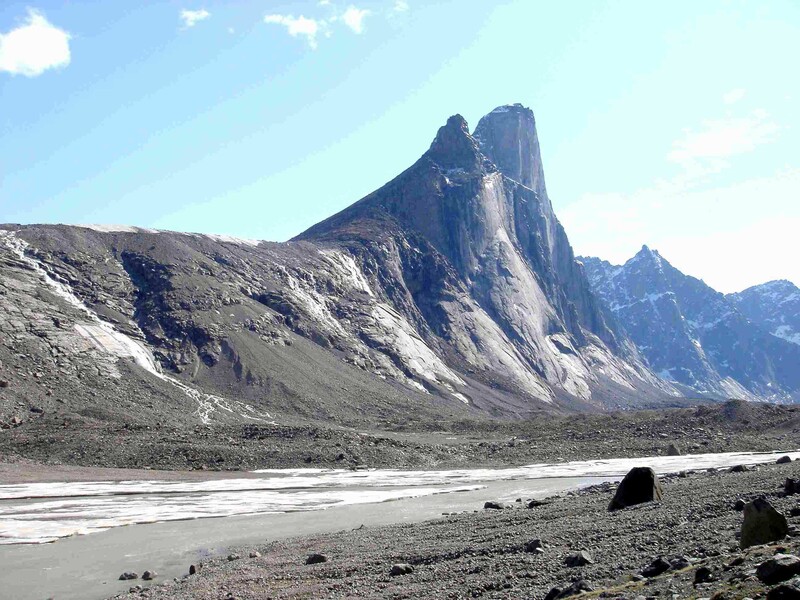 Only Mount Thor on Baffin Island is considered to be purely vertical, with a fall of 1250 meters straight down. These gigantic, supposedly eroded massifs are peculiar because they show little debris at their feet. Great Trango and some of its tall cousins are thought to be "plutons," magma intrusions that melted their way up into sedimentary rock strata and then solidified before breaking the surface. They have been subsequently exposed because the softer sedimentary rocks layers in which they were once encased have been eroded away. The reason that they appear to be so sharp and new is thought to be due to the overburden of sediments that kept them "protected" from weathering. The idea seems reasonable, but it suffers from logical inconsistencies. First, the sediments are nowhere to be seen. The lakes in the area are not filled with silt, although they are refreshed each year by snowmelt and have no outlets. If they have been the catch basins of runoff containing eroded particles for "millions of years" one would expect them to have been clogged-up eons ago. Second, the peaks have to have been exposed for millions of years by now, because they are completely unburied. They have been acted on by freeze and thaw, feeling the full force of hurricane winds, subzero temperatures, and bombardment by sandy grit for thousands of centuries, yet they appear as if they emerged from their stone prisons a short time ago. In a previous Picture of the Day about the mountains of Patagonia, similar oddities were examined. Lakes with no outlets; vertical cliffs accentuated by terraces stepping up their sides; multiple layers; flat-topped mesas with shotgun-patterned potholes on top; clean-floored, narrow valleys; amphitheater-like "blind canyons"; and mountain ranges in concentric rings are manifestly contrary to conventional thinking. Electric Universe theorists postulate that between 5000 and 10,000 years ago (perhaps sooner), the Earth and its sister planets were engulfed in a catastrophic interplay of celestial forces that have not been seen since. Clouds of electrified plasma and electric arcs described by the ancients as "thunderbolts of the gods" dissected the continental geography, creating what traditional theories say are ages-old structures in an instant of time. Sky-high tornadoes of fire writhed across the face of the Earth, excavating canyons, ocean basins, and river valleys. Lakes like inland oceans were vaporized along with their attendant flora and fauna, leaving nothing but scorched and naked stone behind. Those plasma vortices formed intense electrodynamic fields that compressed and lifted material out of the surrounding region. The resulting "fulgamites" are mistaken for intrusions when they are actually extrusions. The Brandberg Massif, Shiprock, New Mexico, and Uluru were given as examples of that phenomenon in past Picture of the Day articles. There is much more that could be written regarding the conflict between observation and theory that seems to dominate science today. There is a need to overcome preconceptions and adopt an approach that takes into account all parts of the observation rather than ignoring those that do not fit the theory.